Choose Your Calling Over Comfort — The Busy Bee Productivity Coaching, LLC. I am so excited to be sharing some takeaways from the Ignite Your Soul Summit weekend I attended in Portsmouth, New Hampshire. At the start of 2018, I made the goal of attending at least ONE live event, as I continue to grow and be the best coach I can be for my clients. The event was life-changing, there are truly no words to describe the impact each speaker had on me, and the room of 200+ women I got to connect with. The summit was two days long; We talked about all things business, money mindset, strong female relationships, forgiveness, spirituality, and our past. More importantly, we were open and had a safe container to be our truest selves, without fear of judgement. We laughed, we cried, we shared stories, and one of the funnest parts- we danced! When was the last time you danced in a room full of strangers without worrying what anyone thought of you? When was the last time you did some powerful inner work and took a giant leap outside your comfort zone? When was the last time you invested in yourself and got “in the room” with people you admire and want to work with? I can see the changes adding up already, because I decided to show up for myself, and for my clients. How can I coach my clients if I’m not doing the inner-work myself? Since the summit, I have created a more positive morning routine. I get ready, make some coffee, pack my lunch, and settle on my reading chair for some time to read and reflect before my day. Since the summit, I went to church for the first time in probably 5+ years. Since the summit, I’ve started making better eating choices, because I want my positive inner-work to show on the outside. I’m ready to be the best version of myself. And because I’ve been doing the work myself, I’m ready to share some of my biggest takeaways with my tribe. Today I’m going to be talking about attracting energy into your work. When it comes to your life and business, are you taking the time for yourself? 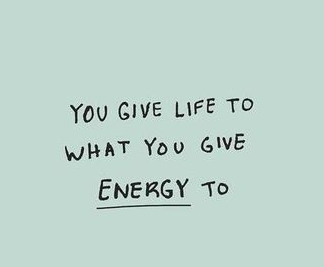 How are you drawing energy into your life? Do you plug into your big vision, or goals daily? Do you have a morning or afternoon routine that keeps you motivated and lets you tap into your true needs? If the answer is no, I’ve got you covered. We can’t be productive or energized if we are feeling stagnant. We cannot live a purposeful life if we are living in a cycle of fear and comfort. We need the energy and motivation to step out of our comfort zone and step into who we are meant to be. 1. Prioritize time for yourself and set it as non-negotiable time. Don’t let this thought overwhelm you, start small! Carve out 15-30 minutes, and remember to start small. Small changes lead to a radical difference. Prioritize this time as a devotion to yourself and your work. 2. Decide how you want to spend this time. What do you love to do? Maybe you want to start meditating, writing, journaling, reading self-help books, or taking a long walk. Reflect on what will make your heart happy! 3. Feel energized by moving your body daily. Energy breeds more energy, so how are you getting out into the world and getting active? 4. Literally, get in the room with people who inspire you and have energy that you admire. Attend a live event, find a coach, listen to podcasts, go to a networking event or join a mastermind. I can’t tell you how much the summit renewed my energy and motivated me to keep doing what I’m doing. Borrow the beliefs from others that have gone before you and take steps forward! I'm ready to do this thing and partner with you, as you take massive action and re-energize areas of your life! The beauty of this message is that it applies to our businesses, work, marriages, friendships, anything! If you enjoyed this blog post, click here to download your free productivity guide, and have your most productive week ever! As always, if you found this blog post helpful, I'd love to hear from you!